Shallots are quite frugal, if you garden. 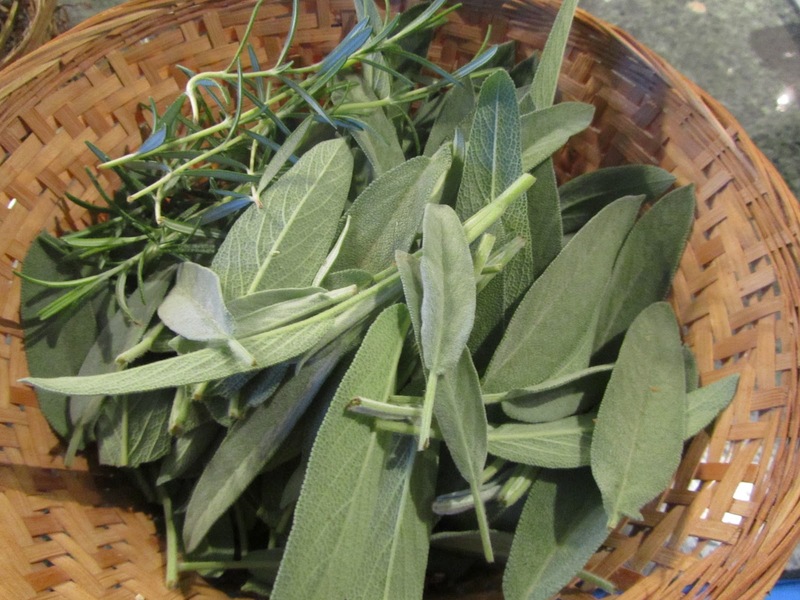 You buy them once, plant them in the fall, dig them next summer, set some aside and plant those for next harvest, then you get to cook with the rest. 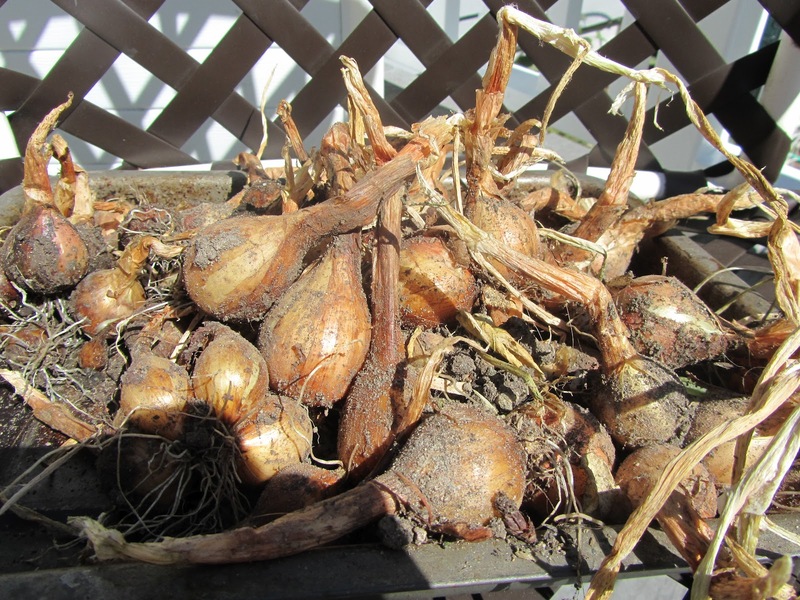 This batch, here, I began 15 years ago with one dozen purchased shallot bulbs. I try to plant the very largest ones of the harvest. The rest I keep in a small bowl on the counter and use them in cooking and salad dressings. 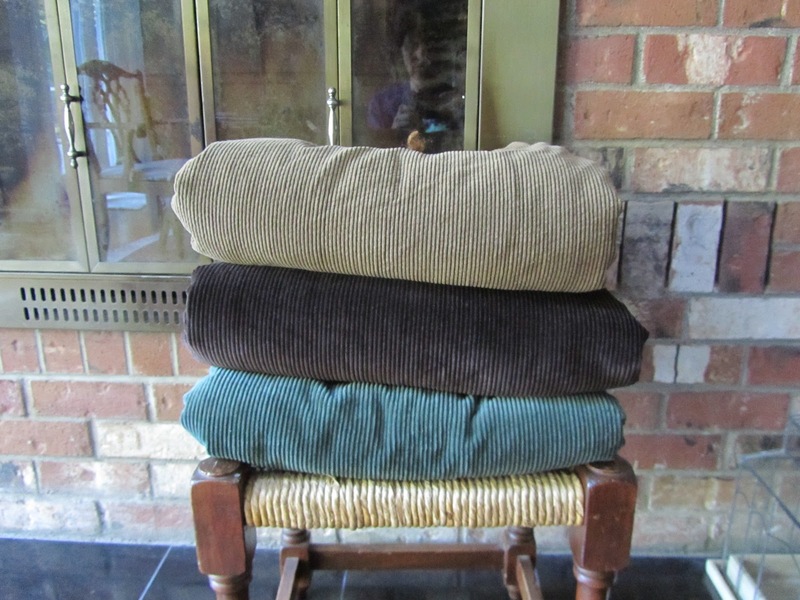 We keep several throws stacked and ready for anyone feeling the chill. They're flannel on the inside and corduroy on the outside. These I made about 10 years ago. My machine was on the fritz that year, so did these just with hand-sewing, and they, honestly, did not take longer than a couple of hours each to make. I only have about a 4 month supply of oregano so far. But I think I can get one more cutting and make that a 6 month supply, not quite enough to get us to next May, when we should have something for culinary use again. So, I'll have to improvise. I'm cutting extra sage, thyme, and rosemary for drying, and will just have to make do in my cooking. 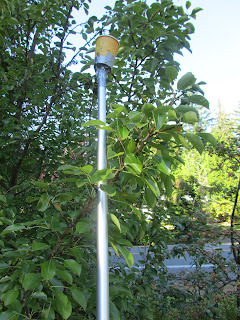 We have two bearing pear trees, one early, one late. We harvested the early this weekend. This used to be just my job, but the tree has grown so tall and was so prolific, I needed assistance. We took turns climbing the ladder, then reached the point where we could no longer grab any pears. Pear branches are quite brittle, and bending them over to pick, often results in branch breakage (I found out the hard way once). The two of us were a comical pair. At one point we had two ladders about 5 feet apart and I was practically hanging from a branch while my son was on the other ladder trying to jump to grab a pear. Clearly this was dangerous, and if we weren't careful, some sense would be knocked into our heads, by a very nasty fall. Chris, the voice of reason in our house, suggested that we needed a tool. I was eager to accept his suggestion, and off the two of us went in search of something to use for said tool. 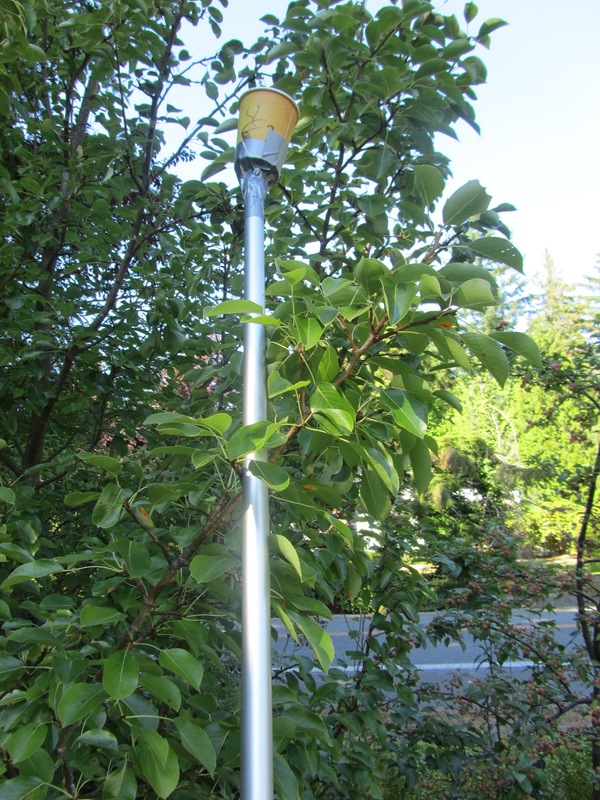 We found an extension pole with a screen on one end (used to scoop leaves out of pools and ponds). To this we duct taped a plastic shopping bag, with the idea of scooping pears right into the bag and gently pulling them from the branch. Brilliant, right? We'd just sweep those pears into the bag and our work would be done in no time. No go. All the pears were getting knocked to the ground and damaged. Back into the house we tromped, but not defeated. And there on the counter was my coffee cup from church earlier (which I had so untidily just left on the counter, shame on me!). Light bulb -- click! 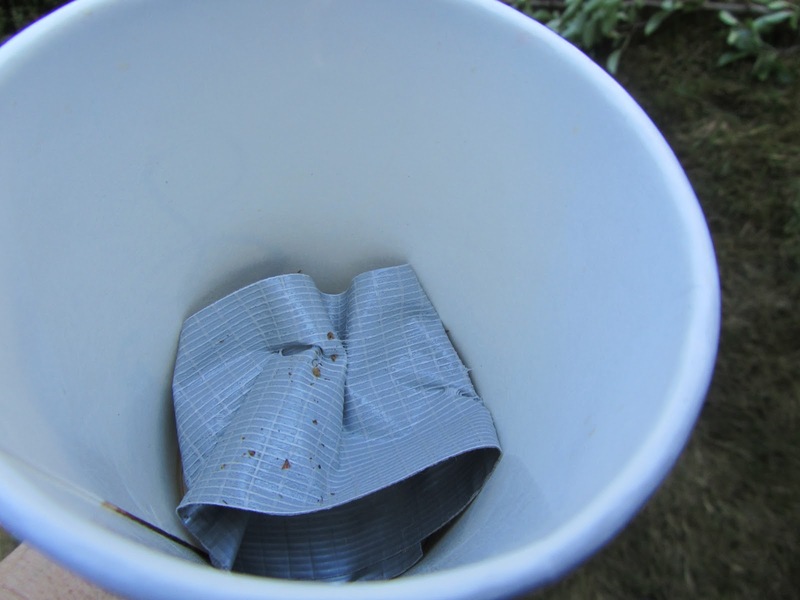 We duct taped the cup to the other end of the extension pole, and looped an inside-out piece of duct tape to tuck into the cup, to catch and hold the pear. Standing on a shaking ladder, and with an upward motion, I scooped the pears, one by one into this cup, and pushed up on the pear until it broke from the branch. Then very carefully lowered the cup, so I could retrieve the pear and hand it to Chris. One by one we cleaned the branches of ripe pears with our handy dandy tool. Not a single pear fell. And the best part is, I wanted to buy a fruit picking tool from Home Depot, if you go here, you'll see the fruit picker that I had my eye on for $39.95 plus tax. Our fruit picker cost about 15 cents in duct tape, total! 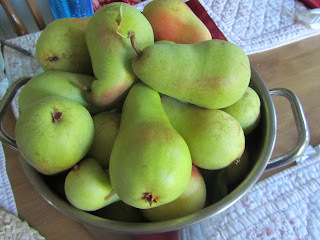 I'll be using this again in October when it's time to harvest the other pear tree. And I'll give it a try on the apple trees as well and see if my "pear picker" is multi-purpose. 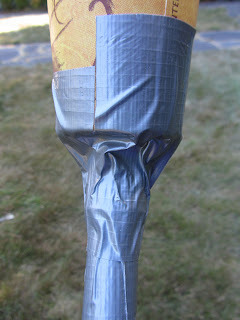 I'll be applying for my patent on the duct tape/coffee cup contraption in the morning. So don't you get any ideas of bringing this to market first! Oh, and as an aside, the neighbor across the street phoned me later and said she and her husband were watching us for about 30 minutes. They had a rip-roaring good laugh over our pear picking misadventures. That's how far I've gotten in my endeavors to ready ourselves for autumn. Do you do anything in particular to ready your home and selves for autumn? Your pears look beautiful. Most fruit from home trees are full of blemishes. Do you do anything special to yours? I don't have the time to fuss with doing much of anything, except plant, water and pick. Maybe I should do more? The only thing "special" we did was choose cultivars with disease resistance. We do get some blemished fruit, but much less than if we'd planted trees without concern for which diseases they were susceptible to. The pears do look spectacular this year, It must be all the rain we received in spring and early summer. Home grown pears have always been smaller for us. We have a really great mail order nursery in the pacific northwest, Raintree Nursery. They give so much info on their trees, and have been incredibly helpful over the phone, pointing me in the right direction for my area. 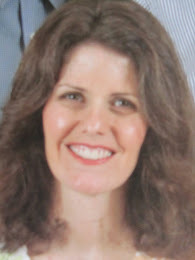 I am sure there are other nurseries who are equally knowledgeable and helpful. Please tell me how you're going to be drying the herbs! Love your pear picker. I made a "rose" sprinkler for my watering can with a ketchup bottle punctured on its bottom duct-taped to the watering can nozzle. Worked perfectly for years until I lost the watering can in a house move. I use a food dehydrator. It's fast and completely dries my herbs. Around here it's a bit damp and my herbs can get a little musty if they're not totally dry when I put them in a bottle. Otherwise, without a dehydrator, my sister in law used to dry her herbs in the microwave. 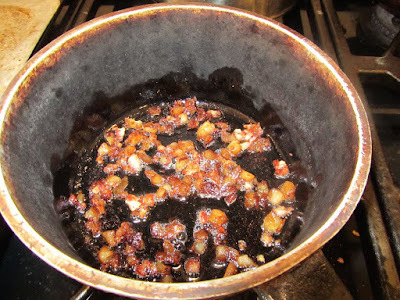 And I've known folks who dry them in their oven with the light on door ajar. We've had some very warm and sunny days this past week. The other option would be to put them on cookie cooling racks and place on the deck for the day. I'd have to bring them in at night, then put outside again the next day. I love, love, love your substitution for a watering can rose! Fixing one thing on an item, instead of just tossing the whole thing is really a fabulous skill to have. Duct tape sure is an awesome material, isn't it? I've used it to fix so much. We even patched the inside of my daughter's ballet shoe last spring with a small piece. Her shoes lasted until her birthday when she got a new pair. And my other daughter had a tiny hole developing in her jeans. So we put a small piece on the inside of the jeans to hold it together until I could get a better patch on it. That duct tape went through the wash several times. Amazing stuff! We're not doing much here to get ready for fall .... not yet anyway. Our falls is usually mild and we still are expecting to have weeks of summer weather yet. However I do keep afghans on hand. We also keep a supply of hot drinks (hot cocoa, teas, and the sort. I envy you and your lovely summer-like fall weather. I can feel the change here already. I put another blanket on the bed this last week, even. Mmm, a nice cup of tea, on a cool day, sounds good. How ingenious to be able to pick your pears without a ladder. Where there is a will there is a way. I am so far behind on getting ready for fall here. I still have a couple of blankets to freshen, and a window to caulk (yes I rent, but little things like that I just do on my own). Instead, I am trying to get little things done outside, I need to pick up hay to winter over the gardens....I really need to get on these things soon. we've done the same in rentals, caulked and such. It made our winters more comfortable, so it was worth a little work on our part. It does sound like you've been very busy, and getting to those outdoor jobs probably is best done now. you're absolutely right. Keeping throws available does help keep the heat bill down. When it's just me in the house, I will hole up in the family room for the afternoon, and a nice throw really takes the chill off. Hope you're enjoying good weather there! Lili, that pear picker is genius! I've been to pick-your-own orchards that have something like that. My shallot plant got lost in the prairie, lol. By the time I cleaned up the weeds in the garden, it was too late, I fear. Now I get to see if the pear picker works on apples as well. I suggested to my son that we buy a taller ladder and he vetoed that right away. I think he sees my age more than I do. He's seeing my 30 years down the road, still climbing trees to pick my fruit! Being on the 2nd floor between two floors is probably insulating for your unit. We had that situation once and it did help keep the place warmer. Shame about the shallots in your garden. Some years the weeds have more will to spread than we do to conquer them. The weeds sound like they were fierce competitors this year. I love the pear-picker :) And the pears do look beautiful. I've never lived anywhere where it snows (apart from one year in the US as a kid), so I have a silly question about veggie gardens - do you have to plant everything again when the snow melts or do the plants survive under the snow? And I had been wondering about how your tomato plant can be growing in winter, that you have growing in a styrofoam box. Tomatoes do not winter over here! It must be quite warm there year round, eh? There are a few things that will winter over here. 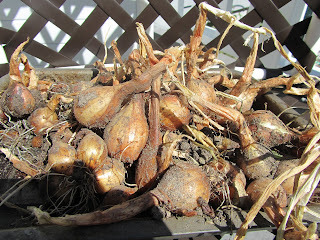 Garlic, shallots, the occasional lost potato, those will begin growth again as soon as the soil warms in spring. In our climate, not too frozen in winter, kale, broccoli and chard all come back in spring for a short harvest, then go to seed. Otherwise, yes, we plant it all again every year. Sounds rather tiresome, doesn't it? But we gardeners are always full of hope. What didn't pan out this year, we can't wait to plant for next, as we're sure next year will be better. We are very spoiled here with our mild winters. We are only seven days into spring and already it's 29 degrees in the daytime (around 85F). I wasn't sure the tomatoes would survive the winter - where I'm originally from the winters are colder, but we still never get snow, but they are still going strong :) We do get very hot summers though. Planting it all every year does sound like a lot of work! So, with such warm weather, do you grow peppers, melons and eggplants? I think I saw a tiny eggplant that was suitable for containers, and many peppers can be grown that way as well. I love your pear picker! Brilliant! I have't grown shallots, but I do grow green onions year-round; they reseed themselves and I just harvest from the edges, without pulling out the whole plant, so they do well for me. That's interesting about your green onions. I may leave a few and see what happens. But that would be frugal and time-saving, not having to replant them each year.